Whether your trusty pair of headphones just bit the dust or you’re tired of listening to the tinny plastic in-ears that came with your cell phone, we’ve all been there: You need a new pair of headphones, and you need to know where to start. Don’t fret. Whether you’re a new iPhone or Google Pixel 2 owner who needs a set of excellent wireless cans (i.e., not the Pixel Buds), a frequent traveler looking to block the outside world, a runner in need of a sweatproof option, or just a music lover, we’ve got you covered. We’ve scoured the market — and spent hundreds of hours testing — to find the best options available for everyone. 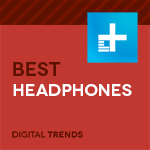 The headphones on this list are the ringers. The value picks. The top guns. So stop tearing your hair out and peruse our curated collection of the absolute best headphones for you, your ears, and your wallet. Why you should buy them: Beautiful wireless sound, plush comfort, and excellent noise-canceling. Who they’re for: Anyone who wants a top-tier wireless experience, without the top-tier price. Sony’s technologically advanced WH-1000xM2 are a follow-up to the already outstanding MDR-1000x model that offer top-tier noise-canceling, excellent quality wireless audio, and plush comfort. This enticing combination earned the model a rare five-star rating in our review, and – thanks to a few notable improvements — makes the latest version the best headphones you can buy. At the heart of the WH-1000xM2 is outstanding wireless sound. Sony’s LDAC technology delivers a wireless signal at what the company claims is three times the quality of standard Bluetooth streaming, and the headphones also support the latest aptX HD codec (with supported devices). The 1000xM2 even “upscale” wireless music from high-resolution audio devices using a special chip, helping to make music sound dynamic and beautiful, with authoritative bass and clear treble response held together by a well-rounded midrange. The WH-1000xM2’s excellent noise-canceling technology ranks second only to the new Bose QC35 II, from the brand that has long dominated the market in terms of sheer noise-blocking abilities. That said, the Sony cans sound much better than the new bass-forward Bose option, and offer numerous features that help to create a much better overall experience. The WH-1000xM2’s advanced control systems allow you to let in various levels of ambient sound, with advanced features like voice-only mode, which helps filter through vocal frequencies so you can hear your music and the voices around you while blocking out other sounds. Responsive touch controls let you navigate volume, make calls, and play and pause music with ease, all while helping to maintain a clean aesthetic. Best of all, the WH-1000xM2 offer a staggering 30 hours of battery life, providing even heavy users with days of use from a single charge. If you’re looking for a pair of extremely comfortable wireless over-ears with great sound and a massive number of features, these are the best you’ll find. Why should you buy them: Amazingly detailed sound, secure fit, and elegant looks. Who they’re for: Serious listeners looking for smooth, accurate sound in any environment. We realize we’ve front-loaded this list with pricey selections, but for serious listeners, there’s also a ton of value to be had in our top three. 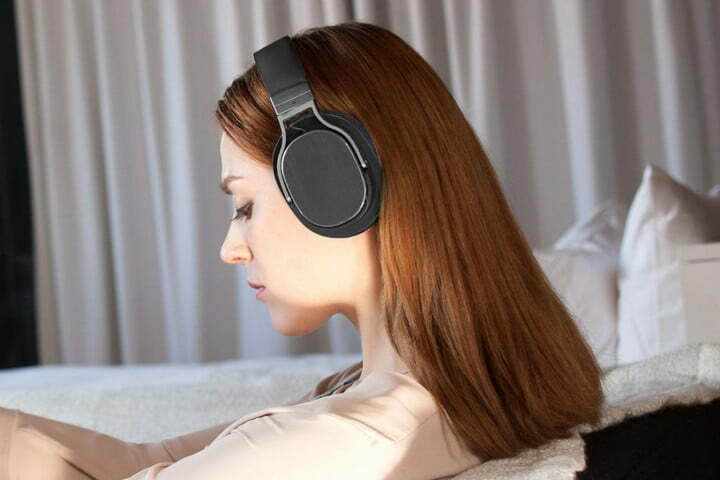 Oppo’s (more) affordable adaptation of its amazing $1,100 PM-1 headphones bring planar magnetic technology to the masses, offering some of the clearest sound and the flattest response of any headphones in their price category and above. What does that mean for you? You’ll hear every solo, vocal line, and subtle percussion cue as though you were in the studio with your favorite artists. We know what you’re thinking: What’s all the hubbub with planar magnetics? Well, unlike traditional dynamic drivers, which create sound by pushing air like a piston for a more-hatchet-than-scalpel approach, planar drivers use a micro-thin membrane excited by a magnet to create subtle vibrations that more accurately reproduce the music you love. Though there are a growing number of planar magnetic headphones in its price range, the PM-3 are more functional in everyday environments than many other options. That’s because where most planar magnetic headphones are open-backed — a design that allows the sound to “breathe” a bit more, but also sacrifices passive noise isolation — the PM-3 are closed-back, allowing you to more effectively drown out the world when you’re on a noisy train or at the office. Bringing shockingly good sound with you everywhere has never been this easy. Whether sitting at home and enjoying your favorite mixes through a dedicated high-end headphone amp or plugging into a great-sounding smartphone like the LG V30, serious listeners will savor the ability to bask in crystal-clear audio anywhere. Why you should buy them: Supreme clarity, durable design, and an optional Lightning connection. Who they’re for: Anyone who wants the best on-ears money can buy — especially Apple fans. The Sine don’t come cheap, but as pricey as they are, you’re still getting a bargain. That’s because Audeze has done something incredible with the Sine, leveraging technology from its pricier (and bulkier) EL-8 headphones to create a pair of planar magnetic drivers that fold down to offer a size and efficiency unimaginable just a few short years ago. Like Oppo, whose PM-3 over-ears also make our best-of list, Audeze has helped push planar magnetic headphone tech by leaps and bounds in recent years, letting you take a highly sophisticated mechanism out of the audio lab and into the real world, and the Sine are the company’s tour de force on this front. Pushing that technology further (iPhone folks, take note here), the Sine can also be equipped with a $50 Lightning cable that receives digital audio directly from your iPhone and transfers it into pristine analog sound. That’s accomplished by a DAC (digital-to-analog converter) that doubles as a three-button iOS mic piece. The design also allows for a digital equalization through Audeze’s app, which allows you to sculpt the sound as you see fit. Even if you don’t roll with Apple, the Sine’s low impedance, cushy yet robust design, and minimalist design make them an obvious choice for audio nuts who want to bring fantastic sound everywhere. With a crystal-clear soundstage and insane separation between instruments, the Audeze Sine will enable you to hear things in your favorite songs that you never have before — providing a truly audiophile-grade listening experience on the go. Why should you buy them: A near-perfect blend of comfort, sound, and portability. 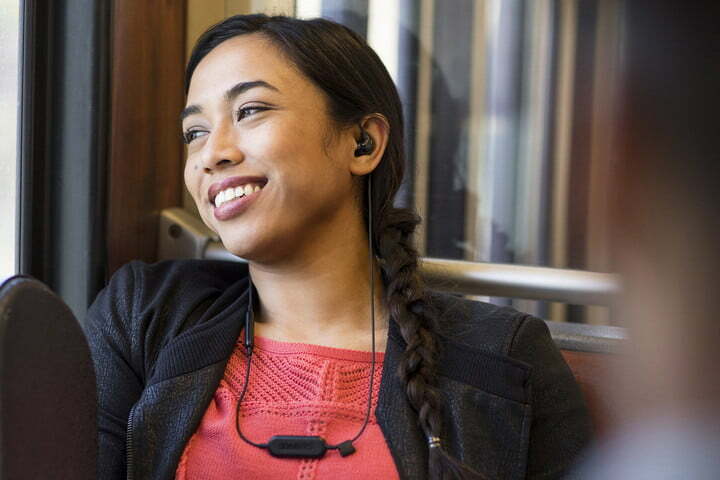 Who they’re for: The active everyday listener who wants great fidelity in a small package. V-Moda’s excellent Forza in-ears offer the perfect blend of fidelity, affordability, and sport-ready performance for any audio adventure. The water-resistant V-Moda Forza are a no-frills pair of earbuds that put excellent sound quality at the forefront, with a round and warm sound signature that pairs well with virtually all genres. A wide assortment of sport fins and tips means that almost any listener will find a perfect seal, and they’re made from a soft rubber compound that ranks them among the most comfortable in-ears we have ever encountered. Because the earbuds are designed to resist the elements, they are a perfect companion for workouts, rainy commutes, or any other outdoor activities that beg for a crisp and clear soundtrack. We’ve used them both in office and on long, rainy runs around Portland, Oregon, and they’ve never let us down. If you’re looking for a pair of headphones that will go with you everywhere and never disappoint, there isn’t a better pair of headphones for $100 or less. Why you should buy them: Good sound, battery life, and functionality. Who they’re for: Listeners who want total wireless autonomy without sacrificing sound quality or sweatproof performance. 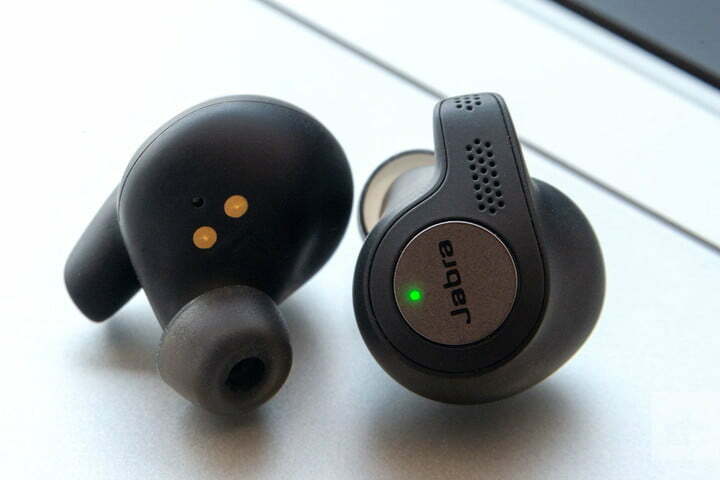 With small extrusions emerging from otherwise understated fully wireless in-ears, Jabra’s Elite Active 65t look like miniature versions of the Bluetooth headsets that helped put the brand on the map. But don’t be fooled by the looks — with competitive battery life, sweatproofing, excellent sound quality, and a myriad of useful features, these little guys best Apple’s industry-leading AirPods as our favorite fully wireless headphones on the market right now. The Elite Active 65t come with three sets of silicone tips and feature an ergonomic design that guarantees a good seal, which is a big reason we prefer them to other fully wireless models. With outstanding comfort and excellent passive noise isolation, you get the most out of every note, and you can also lower the volume for less ear strain. Overall sound quality is solid, and sound comes through clear and balanced, with a punchy bass response and a surprisingly dynamic treble range. Unlike their excellent — and slightly cheaper — predecessor, the Jabra Elite 65t, the Elite Active add an IP56 rating, which means they are protected from high-pressure water jets and limited dust ingress, making them perfect for virtually any excursion, and allowing you to rinse them off after particularly sweaty workouts. In terms of juice, the Elite 65t offer 5 hours of battery life — matching the AirPods and ranking among the best you’ll find — and the included charging case adds two refills on the go. Jabra also matches many of the best features we’ve seen elsewhere in the fully wireless space, with the company’s Sound+ app allowing you to adjust settings like equalization, or whether you want to use your phone’s built-in smart assistant (Siri on iOS, Google Assistant on Android) or Amazon Alexa. Sensors built into the headphones can be set to play and pause music when you remove the buds, and they can even be set to pipe in different levels of ambient sound, which is great for hearing announcements on the plane or your office mate. But perhaps the main reason to buy the Jabra Elite Active 65t is that they always do what you want them to — and never drop the connection. That’s shockingly rare in the fully wireless space right now and, when combined with the other features, it makes these the best true wireless buds you can buy right now. Why you should buy them: Great sound, comfort, and the best price-to-performance ratio on the planet. Who they’re for: Those who want great-sounding headphones at the lowest possible price. If there’s one category the A/V staff at Digital Trends gets asked about most, it’s affordable in-ear models. The fact of the matter is that many of you headphone hunters just want something simple, affordable, and great-sounding, and can’t (or simply don’t want to) spend more than a moderate amount of your hard-earned dollars. So what are the headphones we find ourselves recommending over and over again? Shure’s SE112. This one’s a twofer because whether you go wired or wireless, you’re getting great value. A long-established pair of earbuds from one of the most reputable audio companies on the planet, the SE112 offer clean looks, a comfortable fit, and shockingly good sound for the money in either iteration. These headphones set the bar for low-cost performance, with a pure, open sound signature that easily outclasses competitors in their price range. A snappy high end and punchy — but not too rumbly — bass combine to provide clean detail. Though they aren’t quite as clear as premium headphones, the SE112 easily hold their own against several more expensive models, allowing you to save your cash for something really special down the road. Why you should buy them: Solid audio quality, fully wireless convenience, and impressive sweatproofing. Who they’re for: Those who want to jam out while breaking a sweat, but don’t want wires getting in the way of those reps. Though we still prefer wired sound in the vast majority of instances, one place where wireless headphones have a clear advantage is at the gym. Whether powering through reps or attempting your fastest mile, any kind of cable — even the slim behind-the-head wires of banded wireless headphones — can get in the way. 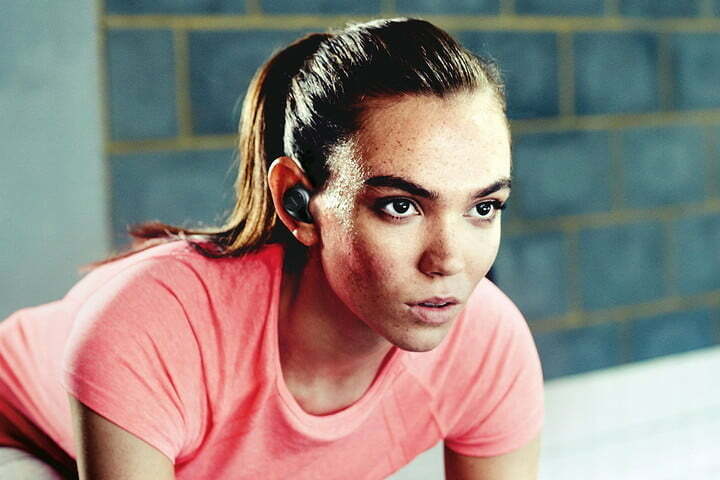 That’s why our pick for the best workout headphone is the fully wireless Jabra Elite Sport. Based off of Jabra’s Sport Pulse Special Edition, the headphones boast an embedded heart rate sensor in the left earpiece, as well as an IP67 rating that means they can be submerged in 3.3 feet of water for up to 30 minutes. That makes them good for short bouts in a pool, and sweatproof enough for the hottest summer days. It also means you can safely rinse them off after extra-strenuous excursions. The Elite Sport offer 4.5-hours of playback per charge, meaning that the headphones will last through just about every workout experience save a marathon (unless you’re one of the fastest runners on earth), and the included charging case adds two extra charges to keep these buds at the ready. Jabra’s Sport Life app offers activity tracking and voice prompts to go along with heart-rate readings during workouts, and you can add and track specific workouts for even more in-depth tracking. Sound quality is solid, with a variety of eartips that offer a great seal for a punchy bass response, and a tight high end that brings a good amount of clarity to your favorite tunes. They won’t offer the same vivid sound signature as more-affordable wired in-ears like the V-Moda Forza, but the added convenience of wireless audio could make up for the price difference for many. If you’re looking to break a sweat while jamming out, these are your earbuds. 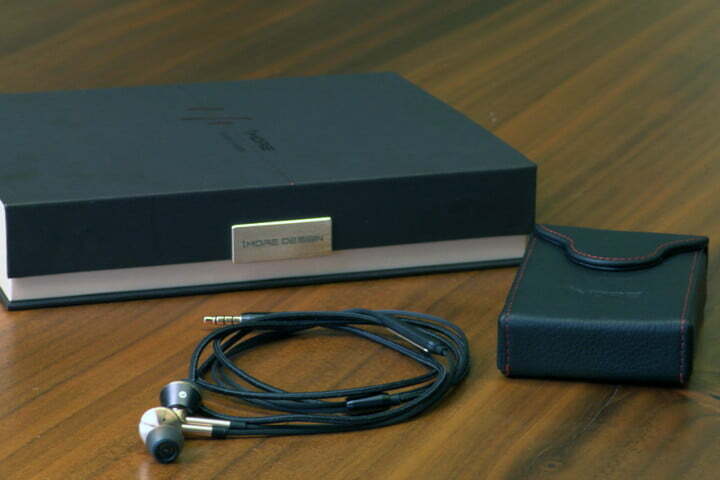 Why should you buy them: Simple style, solid construction, and excellent sound for the money. Who they’re for: Music purists, studio regulars, or podcast pros who want quality cans that take a licking. If you’re a music or media creator in need of a solid pair of headphones that will provide an honest glimpse at your creations — and withstand countless hours of use in demanding settings — look no further than Yamaha’s excellent HPH-MT8 over-ears. Designed by audio professionals for audio professionals, these studio monitor headphones feature two detachable cables (a 1.5-meter coiled cable, and a 3-meter straight cable), and include a screw-on quarter inch connector for use with audio interfaces. Plush leather pads and a padded band join solid metal earcup brackets to create a nice seal and comfortable long-term fit, making them feel great during extended work sessions while keeping sound from bleeding into your microphone during overdubs. Even if you don’t work the audio hustle, the MT8 are a killer pair of cans for price-conscious music fans. Punchy bass and detailed treble are the most prominent sound features, allowing you to hear and adjust every individual element of the sound with astonishing clarity, especially considering their $200 price point. In many ways, you can think of the Yamaha HP8-MT8 as a trusty pair of audio work boots. They may not be the flashiest-looking accessory, but they get the job done every time. If you’re looking for some excellent studio headphones, or just seriously accurate sound, these are among the best you’ll find. Why you should buy them: You want a set of stylish wireless headphones that take constant punishment with a smile. Who they’re for: The everyday listener who wants excellent, life-proof performance. Durability, iconic style, and groovy bass. Sounds like a pretty great combination, right? Those are the hallmarks that make the V-Moda Crossfade II Wireless a killer choice. These are the latest version of the M-100 headphones that put V-Moda on the map and helped the brand become so popular that musical titan Roland eventually decided to buy it. One of the Crossfade II’s biggest selling points is the robust headband, which can be twisted, wrenched, and generally abused with little to no ill effect. The hexagonal earpieces are made from rock-hard plastic, and they’re also customizable thanks to removable plates, which V-Moda will make to order in just about any style you can think of. Under the hood, the Crossfade II Wireless boast 50mm custom drivers that deliver high-quality sound highlighted by striking clarity up top, smooth and precise mids, and powerful bass. Instruments like bass guitar and string bass are rendered with chocolatey goodness and dance grooves are delivered with booming force, all without upsetting the balance required for a quality sonic experience. Throw in a nimble case crafted from Batman-esque putty armor and you’ve got a winning blend. Why you should buy them: A sweet mix of style, Lightning connectivity, and shocking performance-to-price ratio. Who they’re for: The discerning iPhone owner who craves quality, but hasn’t yet landed that corner office. If you’re an iOS user who hates adapters – and you don’t want to deal with the loss of fidelity that comes with a wireless connection — these provide the best value you’ll find in a pair of Lightning headphones (they can also be had with a standard 3.5 mm adapter). So what specifically do the Triple Drivers offer over similarly priced competitors? A gorgeous aesthetic, solid construction — and you guessed it — three dynamic drivers inside for excellent sound. That includes one balanced armature driver each for the midrange and treble, and a dynamic driver for the bass. The result is sparkling clarity, smooth and powerful bass, and balanced sound that outdoes virtually everything we’ve heard at the $100 price point. For this kind of build quality and performance, we’d expect to pay at least double. Need we say more? We run every pair through a rigorous testing process over the course of several days or weeks. That includes playing them in all sorts of scenarios — be it on a bus, in the listening room, or at the office — and playing back from a wide array of sources. We know most people use their headphones with a smartphone, often with lower-quality MP3 resolution tracks, so we do, too. However, we also move up to high-resolution audio files, as well as a wide variety of sources, including plugging in directly to a PC or Mac, using USB DACs (digital-to-analog converters), and employing high-quality, dedicated portable players and amplifiers. 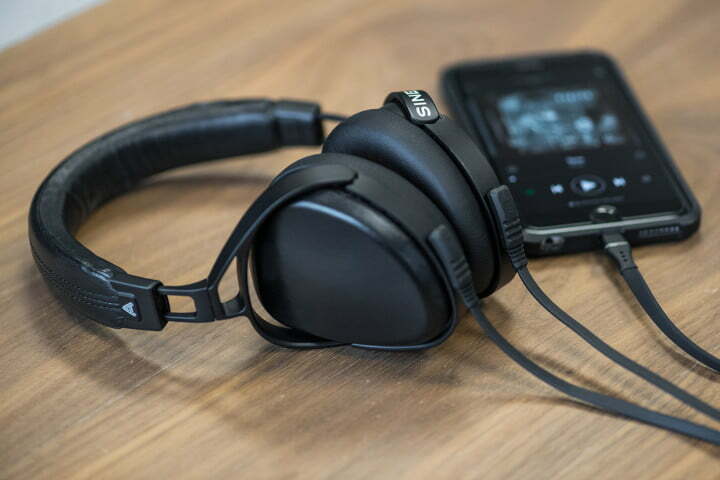 Finally, we compare the headphones to some of our go-to models, both in their class and price point, as well as a level or two above to find out if they can punch above their weight. Published on Fri, 05 Apr 2019 15:53:58 GMT, © All rights reserved by the publisher.